For the assignment this week, I was able to make different types of circuits that started off at the “beginner” level and finished with my “advanced” final product of a 3D parallel circuit with a green, white, and orange light and one 3 V battery. This assignment progressively got more challenging and made me really think about how to plan out where the switch, battery, and lights would be. 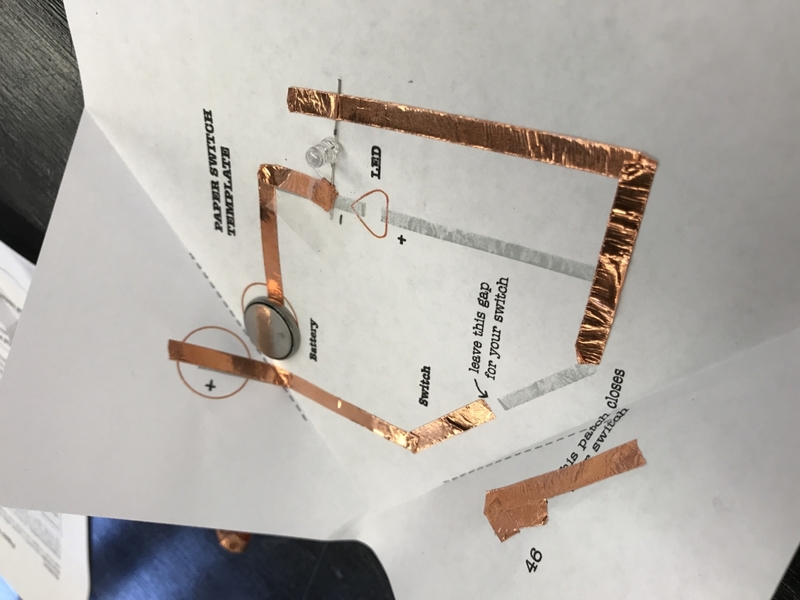 The first assignment was a simple circuit that included copper paper tape, one light, one battery, and one switch. 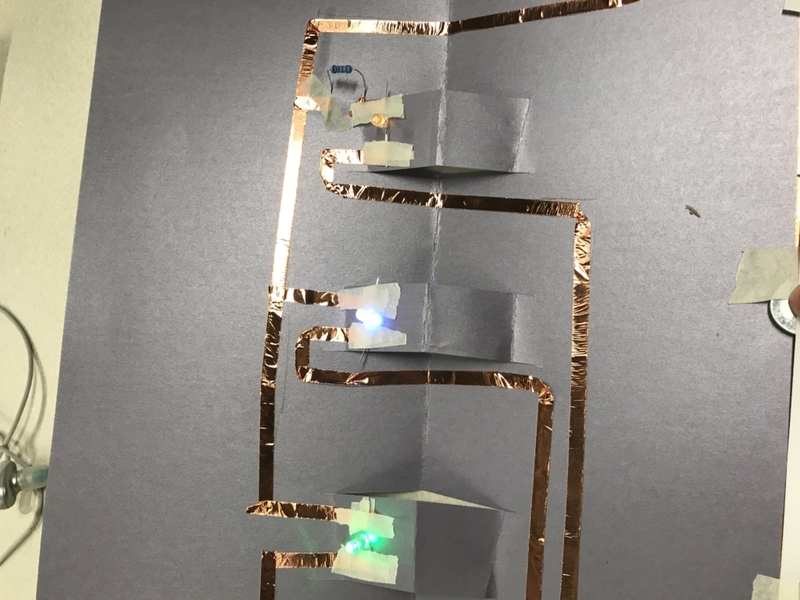 Simple paper circuit constructed in class. For the final product, I started off thinking that I would create a series circuit that would run through my 3D paper circuit. However, after talking with some of the workers at the Fab Lab and other classmates I decided to create a parallel circuit with a green, white, and orange light. 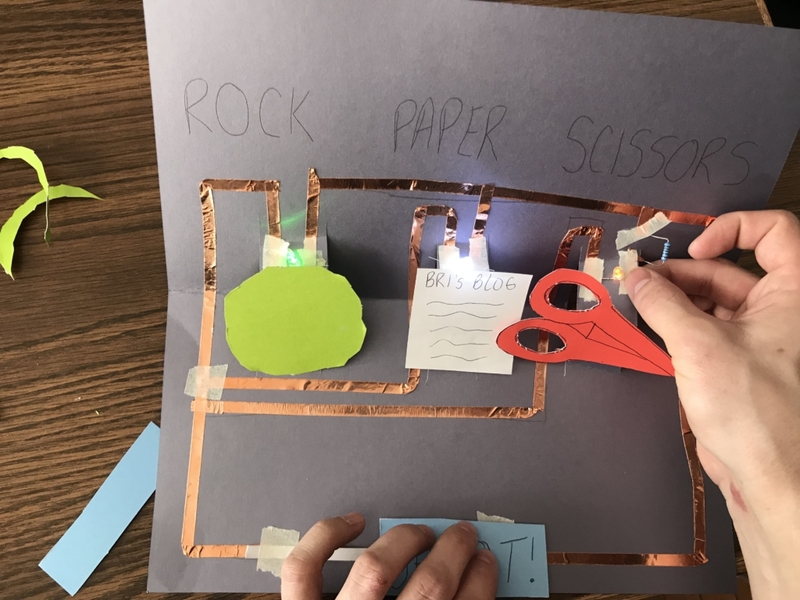 The theme for my product was a “Rock, Paper, Scissors” theme that when the individual would press the button “Shoot!” all three lights would light up. This is my work in progress of my final product! Pictured above is the parallel circuit that I was able to construct. At first, the green and white lights would light up and I struggled with the orange light. But, I got some assistance from the workers at the Fab Lab and added in a resistor to help the orange light light up as you can see above! This step probably took me the majority of my time because it was difficult figuring out the reason why the orange light did not work. Overall, this project was very difficult because I had never worked with electronics before or had to create as intense of a circuit as this one. I was able to get all 3 lights to work, but the orange light is very touchy and if I could do this again I would figure out how to work my project consistently. I am satisfied with how my project turned out though and like how I incorporated my blog into my project with writing “Bri’s Blog” on my paper of my project. For this Vinyl Sticker assignment, I learned how to use the Silhouette Portrait electronic cutter. I also familiarized myself more with the tools in InkScape. The first sticker I made during our lab was the Griffin sticker which was a combination of two different animals. 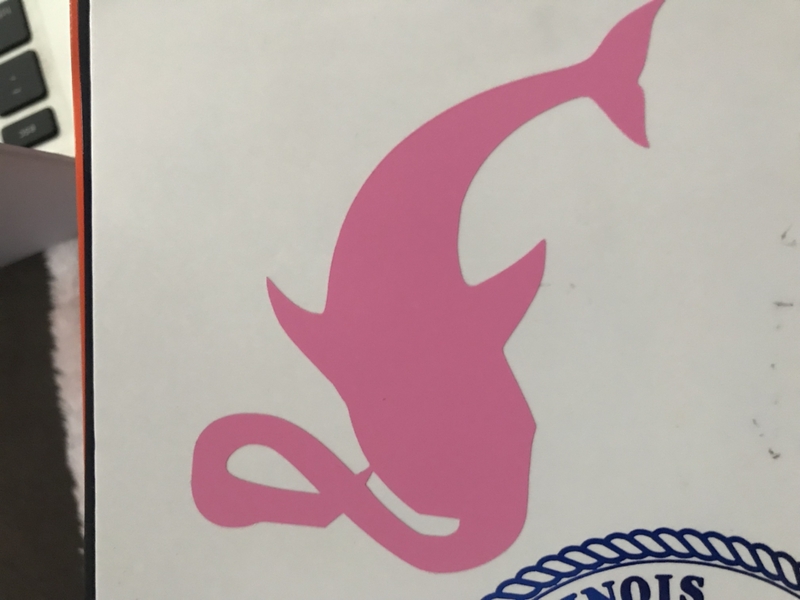 I decided to combine two of my favorite animals which are a flamingo and dolphin. I struggled to break apart and then re combine these two images. I was very pleased with my end result of my mythical creature I created. Here is the combination of the two animals I chose. I chose to keep the head of the flamingo and use the body of the dolphin. 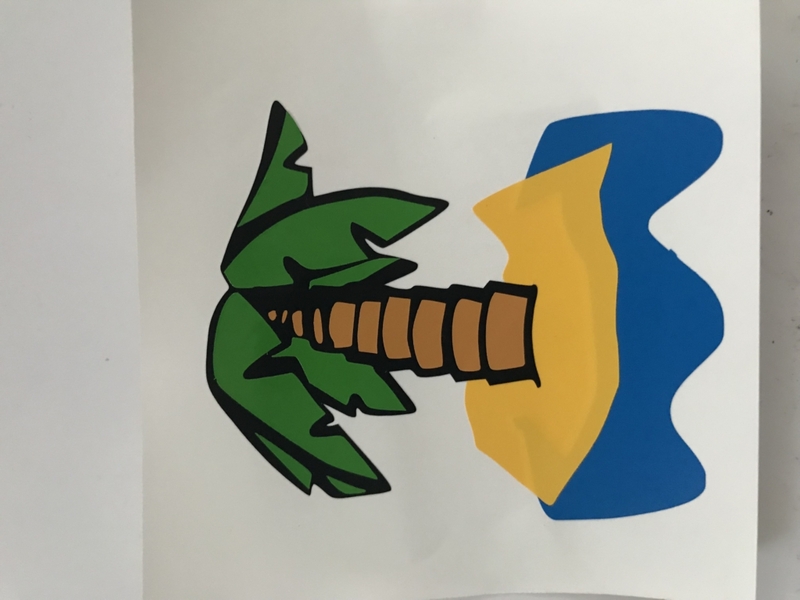 For my final product, I decided to create a sticker of a palm tree. I love anything that comes from a tropical background and decided to continue the trend with my final product. I used two images from the internet and combined them to create my sticker. 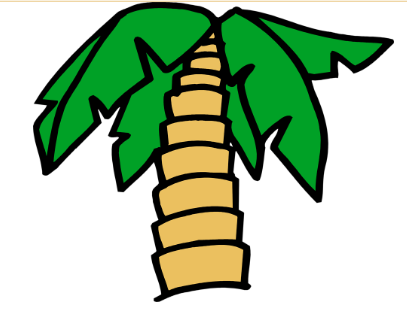 This is the first image I used to create my palm tree. This is the second image I used. 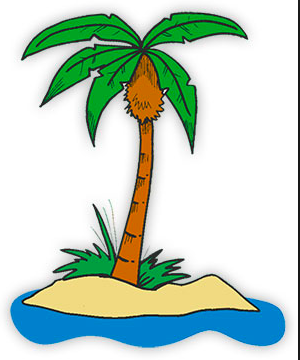 I decided to add the sand bar island and water to my sticker. The process of tracing these images and making sure they would fit together was the most difficult part of the building process. I wanted to make sure the sandbar and water from the second image would be large enough for the palm tree in my first image to sit upon. I had to enlarge these photos and print out my stickers a few times. I received a lot of assistance from workers in the Fab lab. After properly printing my stickers, I had my first layer be the water. My second and third layer was the sand bar and black outline of the palm tree. The layering of the leaves and tree bark for my sticker was the most time consuming part of creating my sticker. I tried to the best of my ability to layer these parts and I was pleased with my final product. Here is my final product that combined both images that I found on the internet. Overall, I was very pleased with how my final product turned out. In the future, I hope to become more comfortable with Silhouette Portrait electronic cutter to create more complex pictures. I thought it was a cool experience to create my own sticker and layer two different images together. For our storyboard, my group decided to do interfaces for driverless cars. I decided to tell a sequence of a family traveling on a road trip from home to Colorado for a ski trip. The perks for the driverless car included: wifi capability, mini fridge, microwave, makeup vanity, and a bed. I included a few safety precautions to ensure there is no need for a driver during the trip. These included sensors to adjust speed during traffic and automatic change in modes during hazardous weather conditions. My story board ends with the family safely arriving in Colorado being very satisfied with how relaxing and safe their road trip was. My first attempt at the storyboard included many of these perks but I did not create a sequence. 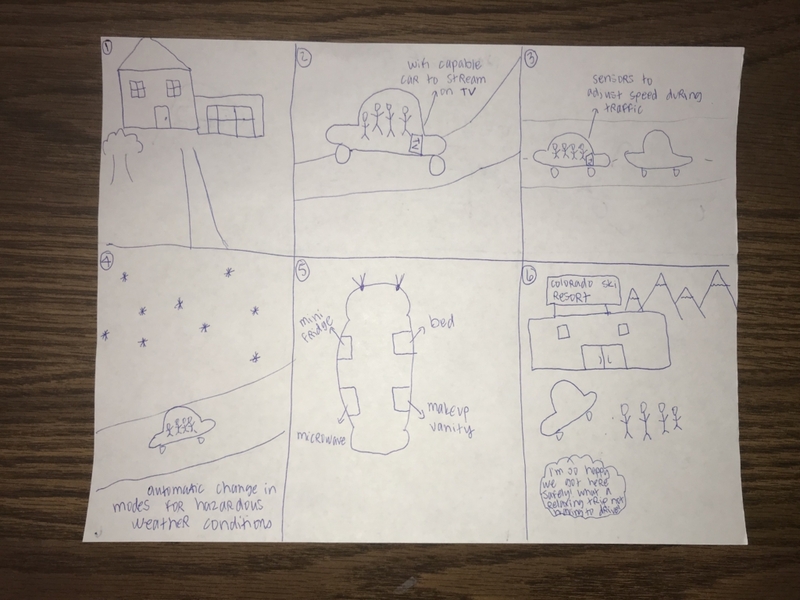 My second attempt had a more detailed sequence of events. During the first few weeks of this course, I familiarized myself with Inkscape and how to use the software to create the design I wanted. I decided to make initial sketches when I was planning the design for this name tag. The purpose of my name tag was to be used for the career fair and interviews. These were the two original sketches I made when thinking of what I wanted my name tag to look like. After creating my sketches, I began working in Inkscape to create my first name tag. I kept my initial name tag simple because I was still unfamiliar with the software. 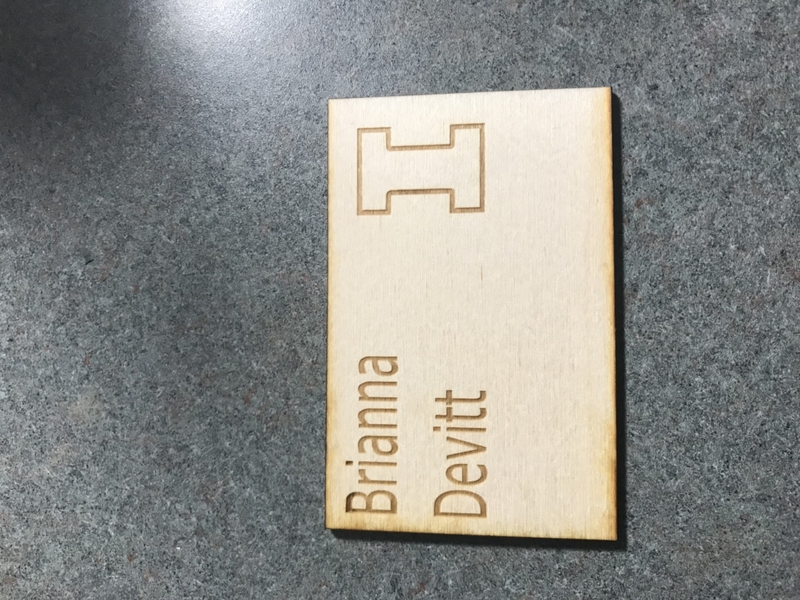 For this name tag, I used wood and included my name and the University of Illinois Urbana Champaign block ‘I’ symbol. It was really fascinating to see how the machines worked when creating my name tag. For my finished product, I wanted to create something that was sleek and simple. As I stated before, the purpose of my name tag is to be used for interviews. 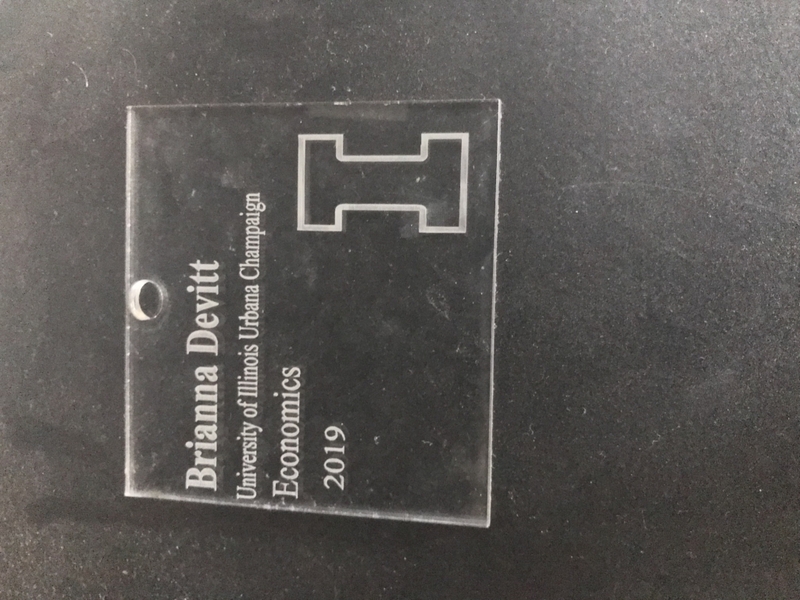 I decided to add more information on my name tag which included the college I attend, my major, and the year I am graduating. I also cut a circle in my name tag so that it could be attached to a lanyard to wear around my neck during office site visits for interviews that require you to wear name tags. I used the Epilog machine and got to experience how it works differently with acrylic rather than wood. I decided to use clear acrylic because I wanted a name tag that was visible but not flashy. 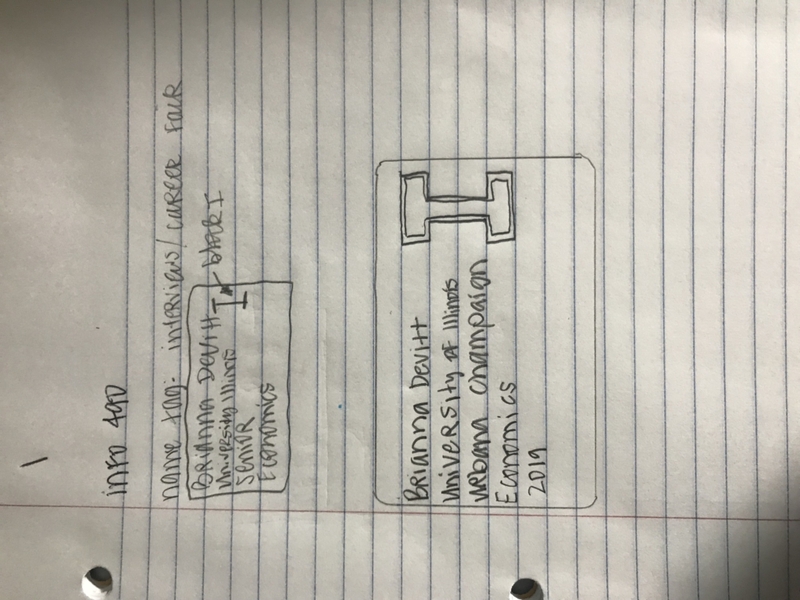 Here is a visual of my final product with some of my information that is necessary during interviews. I really enjoyed this project and learning how to use Inkscape and the Epilog machine. I am very happy with how both of my name tags turned out. However, I wish the writing on my final name tag stood out just a bit more. The best part about this project was that I can use this name tag in the future!